How much is your weekend worth? The West Metro Water Alliance and Blue Thumb rolled out a new clean water campaign at the 2015 Minnesota State Fair. An interactive exhibit in the entry of the Eco Experience will encourage Minnesotans to pledge to "Plant for Clean Water and Pollinators." Fairgoers learned how replacing part of their yards with native plants can help pollinators, save water and keep water clean. Established native plants also require less maintenance - another major benefit! A typical homeowner spends 40 hours a year mowing a standard quarter-acre yard. Replacing turf with natives means less mowing and more relaxation on your weekends. Learn more about planting for clean water, and take the pledge to plant for clean water and pollinators. The enthusiasm of fourth graders continues to strengthen clean water messages across the region. 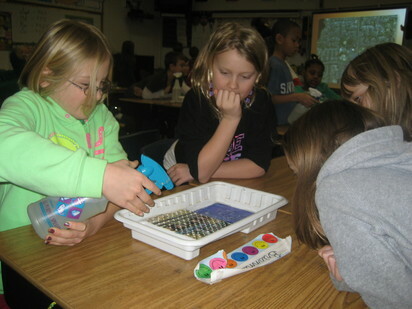 About 3,000 students participated in the West Metro Water Alliance’s (WMWA), “What is a Watershed?” classroom lesson during the 2014-2015 school year. WMWA sponsored the curriculum development and educators to bring this hands-on lesson into classrooms. The program will continue to grow this fall as it enters its fourth year with 42 schools already signed on to participate. The program is offered to all public, charter and private schools in the supporting watersheds. Primary school districts include Anoka-Hennepin, Brooklyn Center, Minneapolis, Osseo, Robbinsdale and Wayzata. Grant funds were recently awarded to the program from the Mississippi Watershed Management Organization to pilot the program in their region of Minneapolis. Learn more and sign up for a classroom visit. Northwood Lake’s future looks a little clearer. This small lake in New Hope is part of the North Branch of Bassett Creek, and its shores are home to water-loving residents and Northwood Park. The area that drains to the lake (over 1,300 acres!) developed before stormwater management was a priority, so the lake is at risk from nutrients and other pollutants draining from the urban landscapes. As a result, the lake is on the state’s list of impaired waters. The Bassett Creek Watershed Management Commission (BCWMC) and the City of New Hope are working to improve the lake’s water quality while conserving drinking water and preserving precious park land. The Minnesota Pollution Control Agency also pledged to help, awarding a $300,000 Clean Water Partnership Grant for the project. The Northwood Lake Improvement Project, slated for construction next year, will include the construction of a 160,000 gallon underground stormwater storage vault that will be used to hold stormwater and irrigate nearby ball fields during dry periods. The project also includes a series of rain gardens, the construction of a stormwater pond west of the lake, and an educational sign informing residents about the project and actions they can take to improve water quality. Although the project comes with a relatively high price tag, it has strong community support and uses the innovative approach of reusing stormwater for irrigation. In addition to funding from the City of New Hope and the Minnesota Pollution Control Agency, the BCWMC will use tax funds levied by Hennepin County on the BCWMC’s behalf. Labor Day has come and gone, which means that the season to deal with leaves, grass clippings, branches and other yard waste will soon be upon us. Yard waste that washes into lakes and rivers through storm sewers add excess nutrients like phosphorous that feed algae and other aquatic plants. This can cause excess algae growth that can negatively impact other plants and wildlife and can be unsafe for pets. Keep grass clippings and leaves out of the street. Leave them on your lawn, compost them, bring them to a compost site, or check with your hauler or city about pick up options. Adopt a storm drain. Keep neighborhood storm drains free of leaves, seeds and grass clippings. Storm drains are directly connected to nearby water bodies, and water running into storm drains can carry with it anything dumped nearby including leaves, grass clippings, soil, oil, paint and chemicals. In an effort to stop the spread of aquatic invasive species, Wildlife Forever and the Star Tribune are partnering to geo-target marketing to educate residents about actions they can take. The project, funded by a Hennepin County Aquatic Invasive Species Prevention Grant, involves targeting smart phones users who are interested in the outdoors with “Clean, Drain, Dry” messages when they are near Lake Minnetonka and Lake of the Isles. The goal of the campaign is to inform boaters, anglers and residents that aquatic invasive species are present in the lake and that a few simple steps can help stop their spread. The campaign has reached more than 400,000 people during the 2015 boating season. For more information, contact Tony Brough at tony.brough@hennepin.us or 612-348-4378. Do you farm or ranch and want to make conservation improvements to the land that you own or lease? The Natural Resources Conservation Service (NRCS) provides landowners free technical assistance and advice for managing your land. Technical assistance available includes resource assessment, practice design and resource monitoring. Examples of improvements include planting a cover crop, no-tilling fields to prevent soil erosion, performing forest stand improvements, providing pollinator habitat and completing an energy audit on your farm. If you are seeking financial assistance, NRCS has staff available to walk you through the application process. Applications for most programs are accepted on a continuous basis but are considered for funding in different ranking periods. Be sure to ask NRCS staff about the deadline. Learn more. Visit the Bassett Creek Watershed Management Commission (BCWMC) at the Golden Valley Arts and Music Festival on Saturday, September 26. The Arts and Music Festival features local food and drinks. Activities throughout the day are held under the Water Tower at Golden Valley City Hall. Learn more! When: Saturday, September 19 from 10 a.m. - 1 p.m.
Join us to celebrate the completion of our Stormwater Park and Learning Center at the Mississippi Watershed Management Organization! Take a walk through a transformed landscape that saves, reuses and cleans stormwater. Then, tour MWMO's community facility featuring interactive displays and exhibits. Learn about the Master Water Stewards, an education and certification program for community volunteers focused on protecting water, from Peggy Knapp with Freshwater Society. Also hear mid-year highlights from Becky Christopher with the Minnehaha Creek Watershed District. The Hennepin Natural Resources Partnership provides a forum for a holistic and collaborative approach to managing and protecting our land and water. Everyone is welcome to attend, especially those from cities, watersheds, agencies and organizations involved with or interested in natural resources management and protection. Saturdays and select Tuesdays through October 10:30 a.m. - 1:30 p.m.
Help restore prairie by collecting native wildflower seed. Volunteers increase the amount and diversity of seed planted annually in over 1,200 acres of restored prairie managed by Three Rivers. Learn about the prairie's rich history and how to identify many of the plants. Youth must be accompanied by an adult. Registration required. When: Saturday, September 5 from 2:00 - 3:30 p.m.
Catch and tag monarchs preparing for their 2,000-mile journey to Mexico. See them in different life stages and learn about tagging research. Search for caterpillars and possibly other insects. Children 17 years and younger must be accompanied by a registered adult. Reservations recommended. Learn more and sign up. Try the fast growing sport of stand-up paddleboarding, an exciting way to explore the water that offers a full body workout. Equipment provided. Various dates and times in September at Cleary Lake Regional Park and Fish Lake Regional Park. Learn more and sign up.